Project that I just don't have time to finish. Land lord, (ok, my wife) says I have Too Many projects. 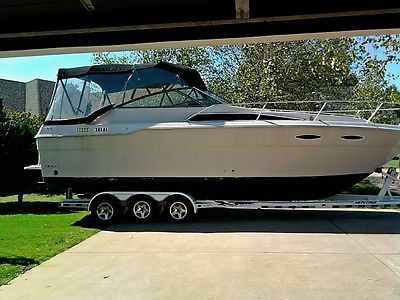 (I agree) 1988 Sea Ray 300 (30'x11') cabin Cruiser. I have started the rebuild process, but have many others in the way. Has Counter-Rotating 350 installed now. Have a freshly rebuilt 350 ready to drop in. This is a twin INBOARD boat. Vacuflush toilet system. Has Air conditioning. Have Onan generator, (runs great), just needs to be reinstalled. Bottom completely sanded and repainted with Interlux Bottom paint. Had new camper canvas made. Clear sides got destroyed by hail and sunshine. (Canvas is fine, though) Just needs to be put back together. If your handy, this is a great project for you! MAKE AN OFFER! Have a trailer for $2500.00 additional, if you need. (Not the white trailer in the picture. That belongs to another boat) No, I do not want to sell parts from the boat, nor do I want to sell a trailer without the sell of the boat. But thanks for asking.